Johann Steinke grew up in Fresno and he is one of the author's of "The Greatest Captain in the World". "It's about two little kids who go down to the dock, this is in colonial American times, and they head down to the dock and meet a sailor and he starts talking about how his captain in the greatest captain in the world. One by one the rest of his crew show up and the stories get bigger and bigger," he explained. Steinke is a real tall ship captain. "I work on traditionally rigged vessels. They look like pirate boats". He's sailed up and down the coast. "When your in such tight quarters with people all the time and you don't have access to the internet or to tv or movies often times people will tell stories. Sailors are famous for telling stories. It's the same culture that's carried down over the years," he explained. His love of the sailor life led him to where he is at right now. Steinke started his journey back in 2008 and with the help of Joel Ruud, a shipmate, and illustrator Andy Catling, he was finally able to publish his book. The book uses words the real-life sailors back in colonial American times would use-- but do not worry if you don't understand the words because there is a glossary in the back. 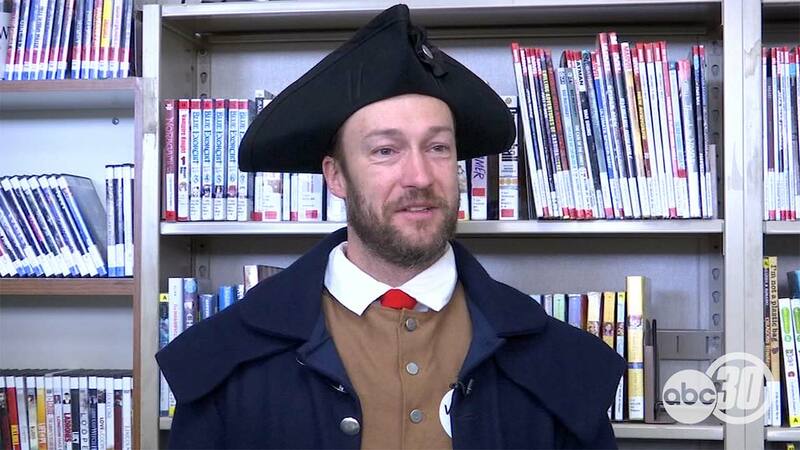 Steinke now goes school to school dressed up as a captain sharing the book. "When I'm talking to the students I'm entertaining them. I'm getting them up. I'm getting them acting some of the stories, having fun, but I'm also trying to illustrate to them what life was like on a boat," he said. While this book will inspire your inner sailor, explorer, and adventurer, he hopes to teach kids about life lessons he's learned at sea. "We got a bunch of different people all crammed together in a small space, I'm not talking about their classroom, I'm talking about the boat, but the classroom is kind of the same way. So how do you get along? How do you take care of your classmates," Steinke explained. "So I try to teach some of the philosophies we use on the ship to keep us all together and working together as a group. " Steinke will be in Fresno until about the end of January then he is headed off to the East Coast to captain a ship. An interesting fact about Steinke is he captained the Lady Washington, the tall ship used in all of the Pirates of the Caribbean movies. If you are interested in purchasing The Greatest Captain in the World click here. If you would like to go to a reading Steinke will be at the Sunnyside Regional Library on Jan 22 and at the Reedley Branch Library Jan 23.